The attacks of 9/11 affected multiple layers of human society and placed a shroud of fear over America not known since its controversial beginnings. Perhaps fiction writer, H. P. Lovecraft, was correct in his assessment of otherworldly forces arising from their sleep and pronouncing an ill fate upon humankind. This certainly seems to be the case with an ancient Mesopotamian pantheon that would later be associated with the Lovecraftian term Necronomicon. Please take note that the following information is taken from my ongoing investigation into how much influence does ancient Mesopotamian mythology had upon the 9/11 terrorist attack. What role did the Ancient Mesopotamian deities have in the 9/11 Attacks? All I ask is that the reader consciously stands outside our reality to get a clear view of what many call “coincidences” turned tragedy. Inanna/Ishtar: The goddess of love and war. She is known as the morning and evening star, a title Jesus uses in Revelation 22:16. In any case, she is associated with the planet Venus. September 11th is the 254th day of the year. One day of Venus is 254 Earth days. Anu: 60 years before the 9/11 attacks, the United States suffered the bombing of Pearl Harbor by the Japanese, which occurred on December 7th, 1941. Anu’s sacred number is 60. 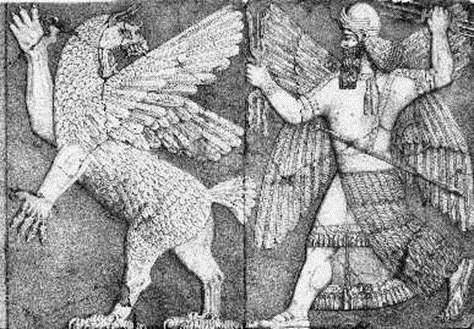 Enki: While Anu was known as the “father of the gods,” he was often invoked with his son Enki. 40 is Enki’s sacred number. “Coincidentally,” 40 years before the 9/11 attacks, John Lennon premiered his epic music video, Imagine, on September 11th, 1971. “Coincidentally,” Lennon was assassinated at the age of 40. “Coincidentally,” Lennon’s video release came 30 years after the attack on Pearl Harbor. 30 is the sacred number of the Mesopotamian moon deity, Nanna. Mesopotamian Planetary Gods: The Babylonian deities and their sacred numbers are: Nanna (30), Nebo (12), Ishtar (15), Shamash (20), Nergal (8), Marduk (10), and Ninib (4). When added together, we get the sum of 99, which is the same sum of 9/11. This is also the simple gematric sum of Lovecraft’s Azathoth. It is possible that were are witnessing how ancient Mesopotamian energies move through society for beneficial and malevolent purposes. Boy, I am so happy that Sitchin was wrong! I think its interesting that Saddam Hussein was rebuilding Ziggurats in Iraq as well !